I did not write the article, I copied it from a website called the kitchen. Public Health Department inspector Rob Acquista explaining health and safety practices. Oh really? Let a health inspector run his gloved fingers over my kitchen? Was I brave enough? I couldn’t turn down a dare, and a few weeks later two city health inspectors, a photographer, and a reporter showed up at my door. Here’s what happened. As you might imagine, I scrubbed my kitchen that morning. I swept the floor, cleaned the sink, and threw out anything suspicious in the refrigerator. I like clean surfaces in my kitchen, but let’s be honest — the floor is usually a little grimy and there’s often something sticky in the back of the fridge. I cook all the time; it’s hard to keep the kitchen pristine. Just as I was getting ready to clean out the sink, Mary showed up with Rob Acquista, a genial and talkative inspector from the Public Health Department, and I took a deep breath. I am not quite sure what I expected. I knew that there were many things that my kitchen wouldn’t have that are required in restaurant kitchens, like a separate sink for handwashing and a bucket full of rags in sanitary solution. And indeed, Rob hardly mentioned details like these. Instead, he started with my refrigerator and went through it shelf by shelf. He brought me a present: my very own refrigerator thermometer! I keep a thermometer in the oven, but never in the fridge. 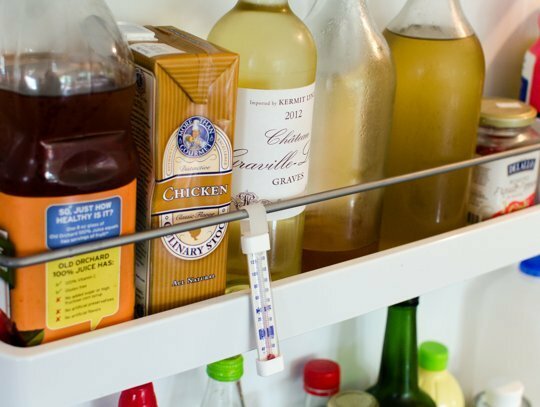 He explained that he likes to keep a thermometer in the refrigerator door, which is one of the warmer places in the fridge, so you can see how cool it gets. The back of your refrigerator could be staying cool enough but the milk in the door might be sweating in a too-warm environment. We talked through meat storage (keeping meat away from other foods in the fridge — even dedicating a drawer just to meat). Then we moved on to food storage at room temperature. Did you know, for instance, that it’s not a good idea to leave cooked rice at room temperature? Rice can grow a toxin called Bacillus cereus which can make you very sick, and it’s not destroyed by reheating. It’s best to immediately store cooked rice in the refrigerator. 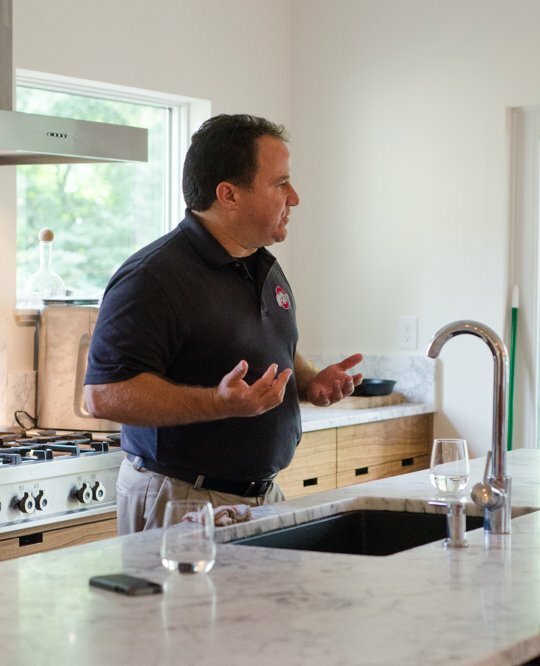 As Rob moved through my kitchen, asking questions and looking at how I cook, I got the clear sense that a real health and safety inspection is much less about the surfaces or even the amount of dirt on the floor. It’s far more about how you handle food. Frequent handwashing, proper food storage, and getting cooked food to a safe temperature in the right amount of time are three of the most important health practices in the kitchen. Here are three more things I learned in my chat with Rob and the rest of the team. Do any of these surprise you? The real rules for getting food into a safe temperature zone are not as difficult as I thought they were. This is one thing that I am usually quite careful about in cooking — getting food into a cooler environment after cooking. But I learned, to my pleasant surprise, that the safety rules for this are actually less demanding than I thought. Rob said that the official recommendation is to cool food from 135°F (or over) to 70°F within two hours. You can use ice baths or ice paddles — anything to cool that food quickly. But after that you have four more hours for the food to cool to the final 41°F or less. That first temperature zone, from 135°F to 70°F, is where the primary amount of bacteria growth happens; it’s the danger zone. I had thought I had just a couple hours to get food all the way down to 41°F, and I often stressed if I found soup still lukewarm in the fridge a few hours after cooking. But these rules are actually more relaxed and yet linked to good data about what actually causes infection or sickness. Don’t leave cut fruits and vegetables at room temperature. As soon as a fruit has been cut open, Rob explained, its integrity has been breached and it can breed germs and toxins. This is a pretty extreme rule for those of us who leave plum halves or slices of peach lingering on the windowsill for eating later. But it’s not fearmongering; some of the worst outbreaks of food poisoning have been traced back to melon or other fruit in salad bars, sitting at room temperature. It’s a prudent practice to put cut fruit and vegetables in the refrigerator. Use rags or dishcloths instead of sponges. This, along with the refrigerator thermometer, is one of the few kitchen setup (as opposed to food handling) tips that I took away from the inspection. Rob practically shuddered when he saw the dishwashing sponge in my sink. He picked it up between two fingers and said that he sees sponges as bacteria breeding grounds; germs just get into those little holes and camp out. He stopped short of saying that I should throw out all my sponges, but he does prefer to use rags and launder them frequently.In the end, I think I came out of my kitchen inspection pretty well; no one checked my windowsills for dust or mentioned the water rings on the table. Instead, it was a fascinating discussion of what matters in kitchen health and safety, and which things a home cook should actually be concerned about. Are any of those notes surprises to you? I consider myself a fairly clean cook, and yet I am not really a germ-phobe; I try to concentrate on the truly major points of staying healthy in the kitchen, while not getting paranoid about every little thing. The inspection reinforced the things I prioritize while also making me a little more attentive to other details. What are the major points of kitchen health and safety for you? What are you especially careful about? This entry was posted in Household, Important Things To Know, Interesting Articles And/Or Pictures, Interesting Food and Other Facts, Other People's Experiences by bonnie. Bookmark the permalink.